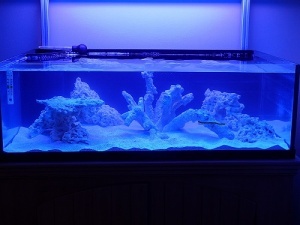 I have an 80 Gallon display tank setup, but most of my corals, mainly zoanthids are in a 30 gallon frag tank that I am replacing with a 60 gallon that I just got. I would use the Mitras Slimlines to try and get better growth and coloration in my zoanthids and try the Ocean Blue and the Actinic. I would aslo get the controller as it sounds as though it has some great features.